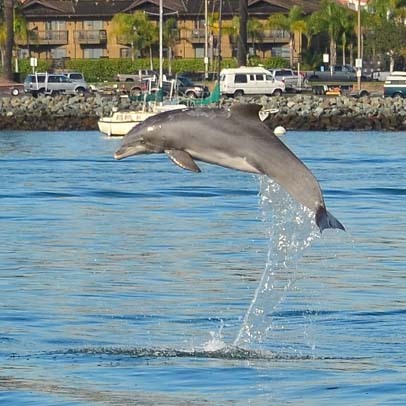 On San Diego's Shores - Dolphins and more! Not a bad spot to go fishing! 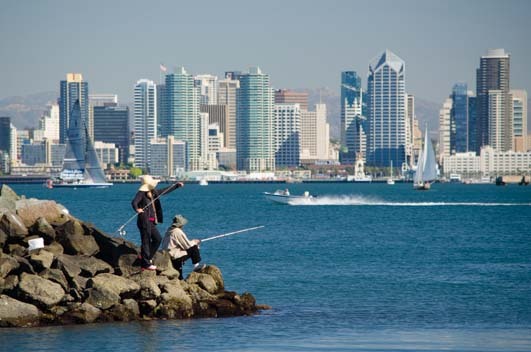 Fall, 2013 – I was standing on Shelter Island one morning, gazing out at the water and the San Diego skyline and watching the fishermen casting their lines while boats breezed by. I had to agree. There is something about the shapes and colors of the buildings and the way they catch the light in the afternoons that is so apealing. And the great thing about this city is that you can play outdoors in fairly warm temps all year long. As summer melted into fall, we did have to wear an extra layer of clothing, but the fishermen continued to fish at the water’s edge and the sailors continued to play with the wind in the bay. 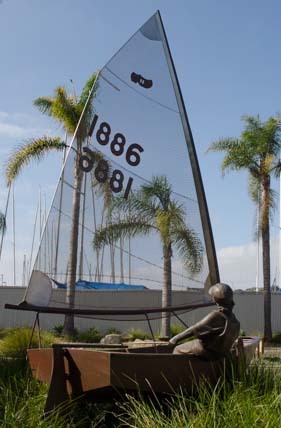 Lots of sailors get an early start at a young age here, and down at the San Diego Yacht Club there is a wonderful statue of a little kid in a sailboat. 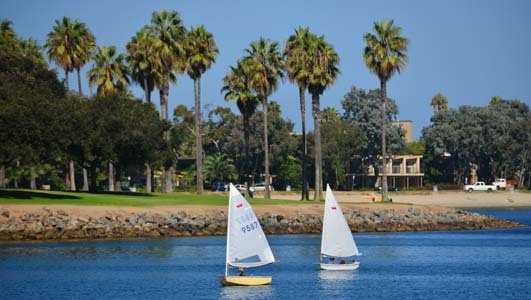 Out on the water in Mission Bay, we saw a sailing class, or maybe a race, cruising past us one morning. Some lucky little kids get to take their first steps on a boat, and so it was with our very young neighbor. His parents Eric and Christi had done a two year cruise around the world on a Nordhavn 43 power yacht a few years back. 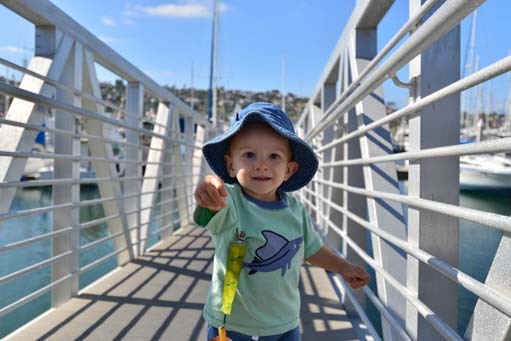 After returning to San Diego to restock their cruising kitty, they had a baby, and they now have plans to cruise to the South Pacific in a few years, once their baby’s sea legs have grown a little sturdier. 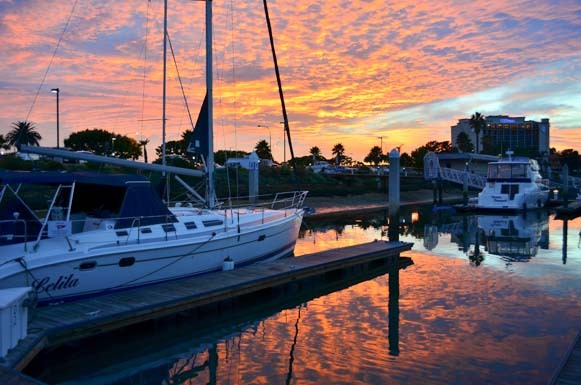 They had never sailed overnight or offshore before that journey, and their first offshore voyage took them straight from San Diego to the Marquesas, a 3000 mile, three week long trip! One of the advantages of cruising in a power boat is that you don’t have to worry about which way the wind blows. So, unlike sailboats that cross the Pacific by dropping down south into Mexico first before they leave the North American coast, these guys just motored out of San Diego Bay and kept right on going! We loved meeting all the sailors on the docks that had cruised to distant shores. Our next door neighbor Brian had cruised to New Zealand ten years ago, and friends of ours, TJ and Jenny, had cruised the Caribbean extensively. They had done that cruise on a solid, older boat, but after a while grew frustrated at its slow pace. Why plod when you can soar, they wondered. So they upgraded to a true racer-cruiser — s/v Rocket Science — that can sail at blistering speeds, and they plan to take her on new adventures in Europe. During their maiden voyage aboard Rocket Science, first mate Jenny had watched in astonishment as the knot meter climbed from 10 knots to the high 12’s in a matter of minutes while she was alone in the cockpit. When the boat hit the mid-13’s knots, she yelled down into the cabin at her husband, the captain, “TJ, you’d better get up here!”. He came running up, totally thrilled at the speed, and they continued their sleigh ride into the mid-17’s. That’s like going 150 mph in a car! 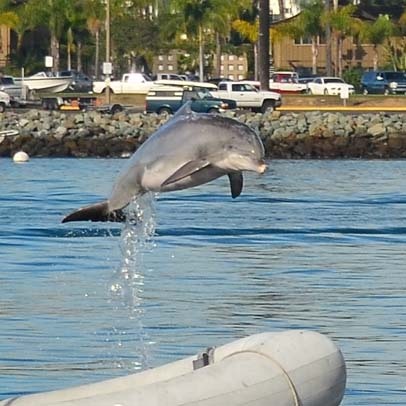 We watched them slip out of San Diego harbor en route to Norway via Central America. What a voyage! 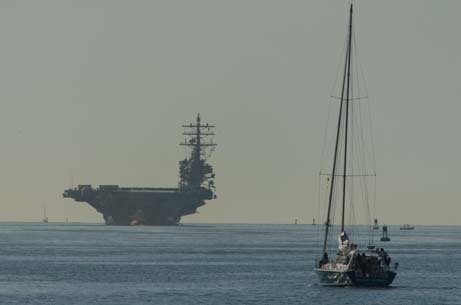 As they disappeared into the distance at the mouth of San Diego bay, an aircraft carrier appeared on the horizon returning from exercises at sea. We watched the two boats approaching each other, and suddenly realized we had friends on both boats, because a young friend of ours in the Navy is stationed on that carrier, the USS Ronald Reagan. Of course, our cruising friends left the bay without too much fanfare, other than us standing on the shore snapping photos and waving. 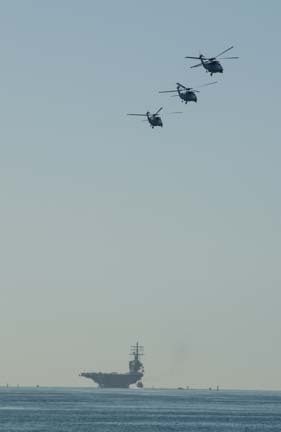 But the aircraft carrier was greeted by a trio of Navy helicopters flying in formation! 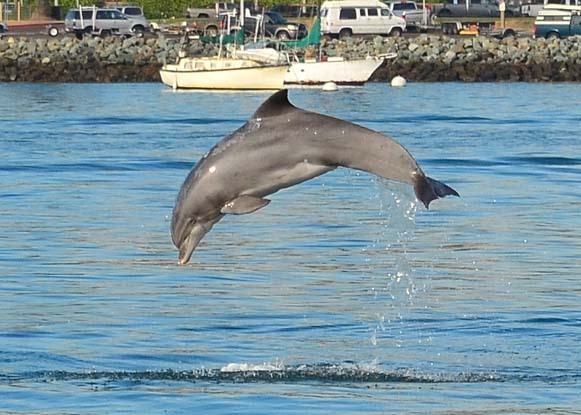 We got out on the bay in our own boat Groovy early one morning, and were astonished by the greeting we received when a dolphin leapt high out of the water nearby. 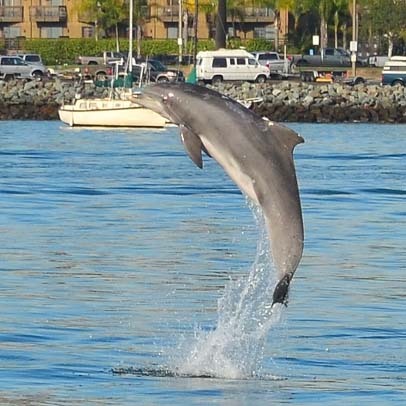 The dolphin paused for treats between leaps! 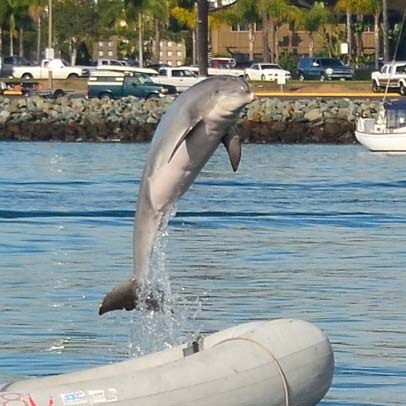 We discovered that this dolphin was an enlisted Navy sailor too. Working with civilian trainers in an inflatable dinghy, he was leaping on command and getting yummy fish treats in return for his efforts. I hope he gets a nice pension for his years of service. Such a thrill to see! 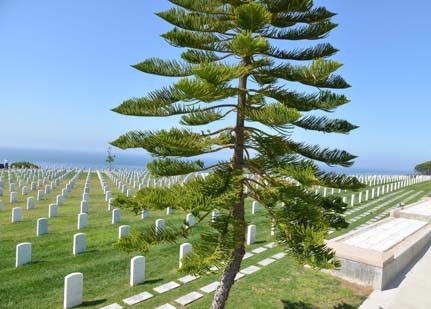 San Diego’s close relationship with the Navy goes way back, and high up on Point Loma there is a Navy cemetery with hundreds of tombstones lined up on rolling, green, grassy lawns. 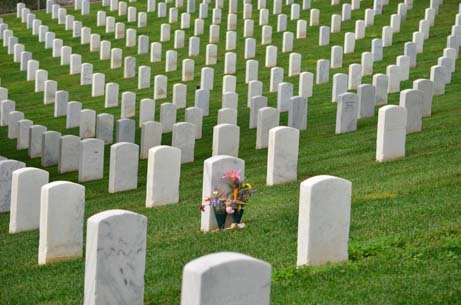 The cemetery has views of both the bay and the ocean, and the endless rows of white stones seem to reach right out to the horizon. This would be a wonderful place to watch a beautiful sunset, and Mark traipsed up there, camera in hand, on quite a few occasions, hoping for glorious red skies. But Mother Nature has a mind of her own, and each time he made the trek, he came home disappointed with just a handful of shots that, while lovely, didn’t have the magic he’d hoped for. The “out of this world” sunsets seemed to be reserved for the days when we weren’t paying attention and weren’t ready. We’d be busy on the boat, deeply engrossed in some project, when we’d peak out the windows and our jaws would suddenly drop when we caught sight of the colors in the sky. To add to the drama, our sunset views from inside the boat are fantastically enhanced because the windows in the hull are tinted pink! We’d leap up out of our seats, throw everything aside, and dive for the cameras — which were never where they should be, always had the wrong lenses attached, and had been left in some weird mode that produced blown out or black images for the first few photos. Oh well! We’d still click away, happy as clams, hunting for ways to get a unique perspective on whatever was happening in the sky. 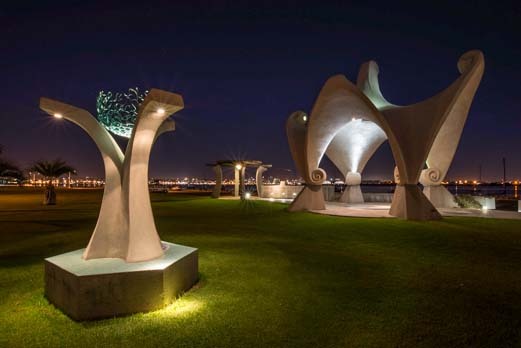 Mark enjoyed getting out for night shots too, and Shelter Island’s unusual sculptures offered lots of interesting opportunities. 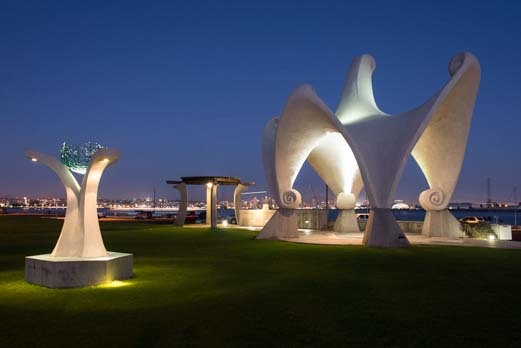 There is a big grassy lawn with two large structures on it that represent the undulations and curves of waves on the sea. During the daytime these are a little bit funny looking, but at night, when spotlights shine on them, they come to life. The magic hour is just after sunset when the sky makes a brilliant blue backdrop, but I also really liked the silky, inky black of night. 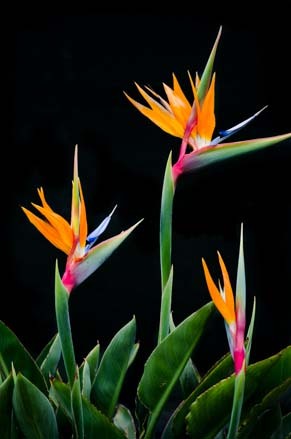 This is a fun time to play with lighting, and he got a wonderful photo of a trio of bird of paradise flowers too. 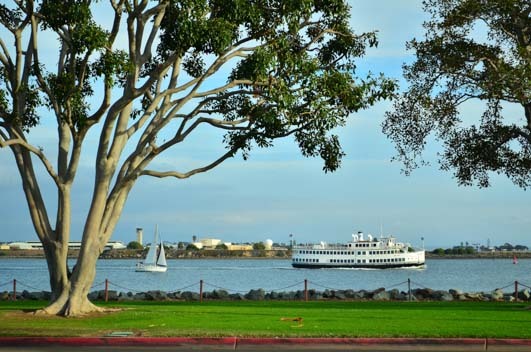 These were happy days for us on the shores of San Diego Bay. After a while, though, we finally tore ourselves away from the action nearby to go looking for adventure a little further afield. We didn’t have to go too far — Sunset Clilffs and Balboa Park were just a stone’s throw away. This entry was posted in California and tagged Birds and Wildlife, California, California San Diego, New, Travel, USA, Wildlife, WP Travel by Roads Less Traveled. Bookmark the permalink.